Jayashree, K., Kota Nagappa, D. (2011). The Cytology of Subcutaneous Chest Wall Metastasis Originating from Bronchiolo- Alveolar Carcinoma. Iranian Journal of Pathology, 6(4), 212-215. Krishnamurthy Jayashree; Divya Kota Nagappa. "The Cytology of Subcutaneous Chest Wall Metastasis Originating from Bronchiolo- Alveolar Carcinoma". 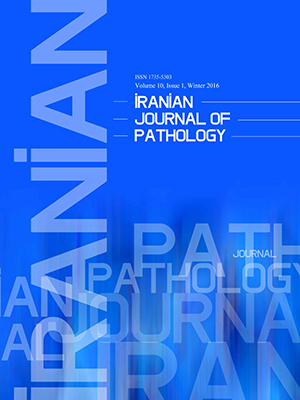 Iranian Journal of Pathology, 6, 4, 2011, 212-215. Jayashree, K., Kota Nagappa, D. (2011). 'The Cytology of Subcutaneous Chest Wall Metastasis Originating from Bronchiolo- Alveolar Carcinoma', Iranian Journal of Pathology, 6(4), pp. 212-215. Jayashree, K., Kota Nagappa, D. The Cytology of Subcutaneous Chest Wall Metastasis Originating from Bronchiolo- Alveolar Carcinoma. Iranian Journal of Pathology, 2011; 6(4): 212-215. Bronchiolo-alveolar carcinoma with subcutaneous chest wall metastasis is a very rare presentation. A case of 36- year-old male with metastatic subcutaneous chest nodule of bronchiolo-alveolar carcinoma, diagnosed by fine needle aspiration cytology, is reported here. Cutaneous metastases are of diagnostic importance because they may be the first manifestation of an undiscovered internal malignancy and indicates a poor prognostic sign. Fine needle aspiration cytology plays an important role in the early diagnosis of subcutaneous metastasis and helps to differentiate from other subcutaneous nodules like skin adnexal lesions, soft tissue tumors and inflammatory lesions. Rosenblatt MB, Lisa JR, Collier F. Primary and metastatic bronciolo-alveolar carcinoma. Dis Chest 1967;52(2):147-52. Auerbach O, Garfinkel L. The changing pattern of lung carcinoma. Cancer 1991;68(9):1973-7. LIEBOW AA. Bronchiolo-alveolar carcinoma. Adv Intern Med 1960;10:329-58.:329-58. Lau G, Tan SY, Chiang G, Poh WT. Bronchioloalveolar carcinoma with metastasis to the pituitary gland: a case report. J Clin Pathol 1998;51(12):931-4. Singh R, Lehl SS, Sachdev A, Handa U, D'Cruz S, Bhalla A. Metastasis to thyroid from lung carcinoma. Indian J Chest Dis Allied Sci 2003;45(3):203-4. Mallens WM, Nijhuis-Heddes JM, Bakker W. Calcified lymph node metastases in bronchioloalveolar carcinoma. Radiology 1986;161(1):103-4. Yeh KY, Chang JW, Hsueh S, Chang TC, Lin MC. Ovarian metastasis originating from bronchioloalveolar carcinoma: a rare presentation of lung cancer. Jpn J Clin Oncol 2003;33(8):404-7. Schwartz RA. Cutaneous metastatic disease. J Am Acad Dermatol 1995;33(2 Pt 1):161-82. Brownstein MH, Helwig EB. Metastatic tumors of the skin. Cancer 1972;29(5):1298-307. Reingold IM. Cutaneous metastases from internal carcinoma. Cancer 1966;19(2):162-8. Silverman JF, Finley JL, Park HK, Strausbauch P, Unverferth M, Carney M. Fine needle aspiration cytology of bronchioloalveolar-cell carcinoma of the lung. Acta Cytol 1985;29(5):887-94. Johnson W. Lever's Histopathology of Skin. 8th ed. Philadelphia: Lippincot-Raven; 1997.